To create and publish a curated collection, follow the steps below. In the pop-up window that opens, enter a name and an optional description for your collection, then click Next. Click the lock to make your collection private so that other curators from your library can't edit it (or, if your collection is already private, click the key to unlock it). Click the pin icon to pin or unpin your collection. You can only add titles to pinned collections, and you can pin up to 10 collections at a time. Edit your collection name (this will appear on your OverDrive website) and collection description (at this time, the description is just for your own reference, but in the future this may display publicly). If your OverDrive website offers site translations, use the "Language" field to choose each language you offer, then enter a translated collection name and description for each one. Under "Display," choose how the titles you add to your collection will be displayed. If you choose to randomize the display, the titles in your collection will re-order with each new user session. Under "Publishing locations," choose where you would like this collection to appear on your OverDrive website. Learn more about publishing locations here. Click Save draft to save any changes you made on the collection details page. Next, search for titles to add to your collection with the search options at the top of the page. Note: Your search results will only contain titles that you already own. From your search results, you can add a title to your main collection (this is your first pinned collection) by selecting Add to main collection. Or, to add a title to a different pinned collection, select the collection from the drop-down menu. For your reference, you'll see a list of all your pinned collections in the right-hand column, next to your search results. Note: You can take a break from working on your draft at any time, and titles you've added to the collection will be automatically saved. To review or edit your collection, return to your collection details page by clicking on the collection in the right-hand column (next to your search results). You can also click the View collections button to go back to the main Curate landing page and open any collection. 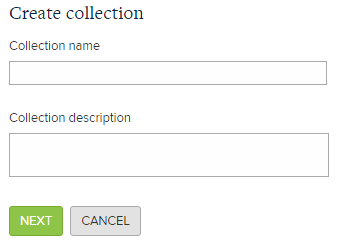 When you're ready to publish your collection, click Publish from the collection details page. In the pop-up window that opens, click Publish again. Note: Published collections generally appear on your OverDrive website within 30 minutes. However, some collections may take up to 24 hours to appear.